Though obsolete in the European theatre of operations, the Matilda remained advanced compared to contemporary Japanes tanks. The Australians found that he Japanese had to resort to shooting at the few vulnerable parts of the otherwise impenetrable Matilda, and so created their own armoured upgrades to protect these points - giving them a distinctive look. Whilst Australian markings were based on British practice, they naturally had their own approach. This set provides markings for thirteen distinct examples from all five of the units that operated the Matilda. 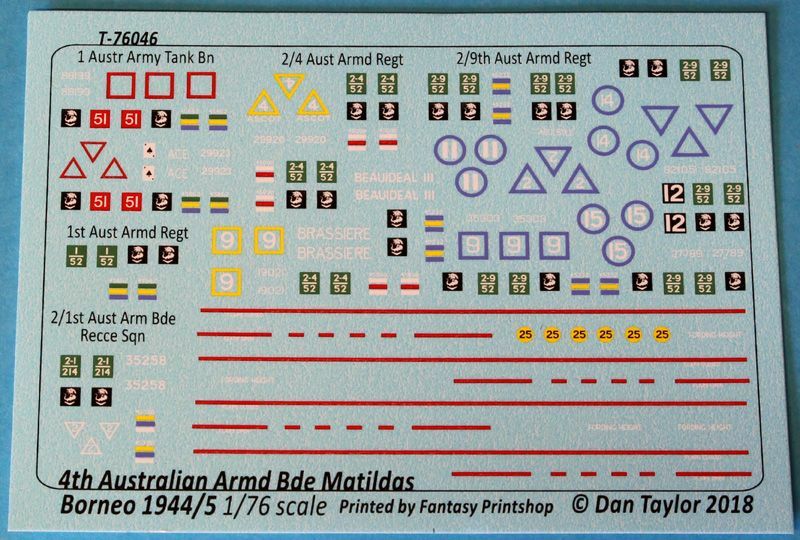 This set is designed to accompany our 'Australian Matilda Mk IV Conversion Set' for the S-Model Matilda kit, so is drawn in 1/72 scale. 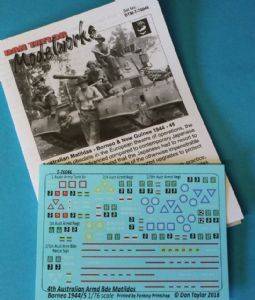 It is, however, suitable for 1/76 models too.